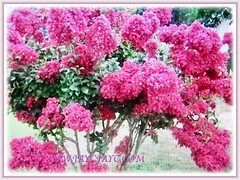 The Crape myrtle with frilly and crepe-like flowers of varying colours is simply spectacular and very irresistible. Plant this free-flowering beauty to colour and brighten your garden all year long. It will definitely be the envy of your neighbours! 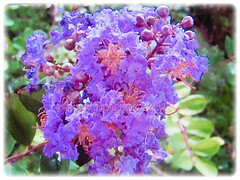 Common Names: Crape Myrtle, Crepe Myrtle, Crepe Flower, Japanese Crape Myrtle, Indian Crape Myrtle. Etymology: The genus name Lagerstroemia is in honour of Magnus von Lagerstroem, a Swedish naturalist and merchant. One of its common names, Japanese Crape Myrtle is saru suberi in Japanese, literally monkey slip which refers to the smooth, slippery bark. 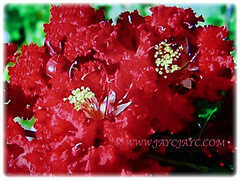 Origin: Native to Japan and China. An ornamental and perennial tree or shrub. 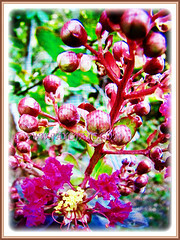 Features: Lagerstroemia is a genus of about 50 species of flowering plants. A favourite with hybridisers who have introduced numerous hybrids, cultivars and varieties. 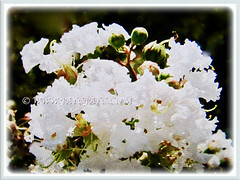 With the development of new hybrids and cultivars, Crape Myrtle now comes in various shapes and forms. The plants may be knee-high shrubby dwarf to towering tree forms. Different varieties can be naturally rounded or upright and vase-shaped. Generally, this upright-growing and sparsely branched shrub will reach between 2-8 m in height and spread as wide. All year long, it produces conical panicles of frilly, crepe-like inflorescences in varying hues of white, pink, lavender, purple, magenta, orange, dark red and even bicolours, up to 20 cm long. Eventually, the flowers will develop distinctive seed heads. The fruit is a capsule, green and succulent at first, then ripening to dark brown. It splits along six or seven lines, producing teeth, quite similar to those of the calyx, and releases numerous small and winged seeds. 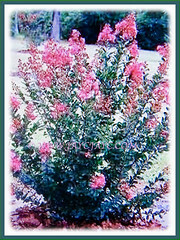 Culture (Care): Lagerstroemia or Crape myrtle can be easily grown with minimum care. Moisture: Medium water needs. Once established, it is quite drought-tolerant. It benefits from a humid environment. Soil: Humus-enriched, loamy and well-draining soils. It prefers a slightly acidic soil. However, it does well in any kind of soil, provided it is well-drained. Others: Deadhead the flowers and foliage to keep the plants tidy and aesthetically pleasing. Their slender branches bend under the weight of their inflorescences, and should be cut back after flowering to stimulate new growth from the base. 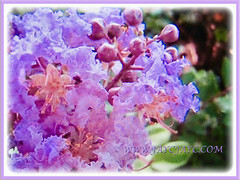 Feed Crape myrtle once every two months with with a general-purpose or high-nitrogen fertiliser. Alternatively, using a slow-release fertiliser can help prevent rapid sucker growth that is vulnerable to diseases and insects. Too much fertilisation will result in excessive leaf growth and fewer flowers. A hardy plant that is generally free from serious disease or insect problems. Nevertheless, it is susceptible to powdery mildew, mealybugs, red spider mites, sooty mold, leaf spot and root-rot that is caused by poorly-draining soil. 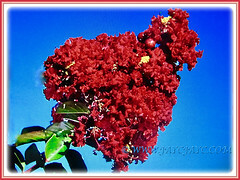 Lagerstroemia or Crape myrtle are deciduous in the temperate regions. They are generally cold hardy to zone 7 and possibly 6, depending on the cultivar. In zone 6, they are likely to die back to the ground in winter. In frost-prone areas grow against a warm, sunny wall or overwinter in a cool greenhouse or conservatory. Choose the cultivar that best suits your climate. Their combination of spectacular summer flowers, colorful autumn foliage and handsome sculptural trunks will definitely not prevent you from adding one to your garden. They bloom on the current season’s growth. After blooming, they develop distinctive seed heads, then the leaves tend to fall toward the end of autumn, leaving the colorful, exfoliating bark for the winter. Propagation: By seeds or softwood cuttings. 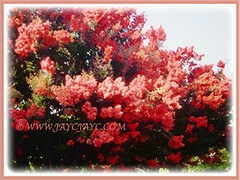 Usage: Lagerstroemia or Japanese Crape myrtle with its numerous colourful inflorescences will be excellent as landscape, specimen and accent tree. 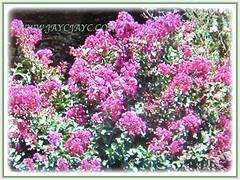 These flowering shrubs are beautifully colored and are often grown, both privately and commercially as ornamentals. Great too for container gardening or ground planted in garden beds, shrub borders and public parks.